Pre-workoutScitec WOD Unbroken Pak - 99 kaps. 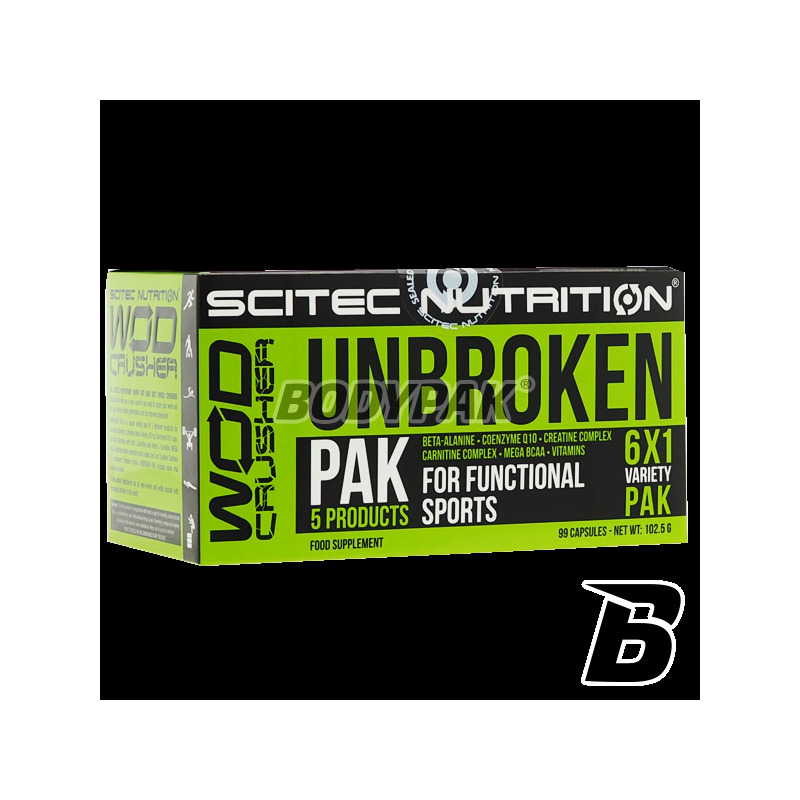 Scitec WOD Unbroken Pak - 99 kaps. The unique combination of five different products for functional athletes. Beta-Alanine contains 50 mg of coenzyme Q10, Carni Complex with L-carnitine and acetyl L-carnitine, MEGA BCAA. CONTAINS A NUMBER OF ESSENTIAL VITAMINS! 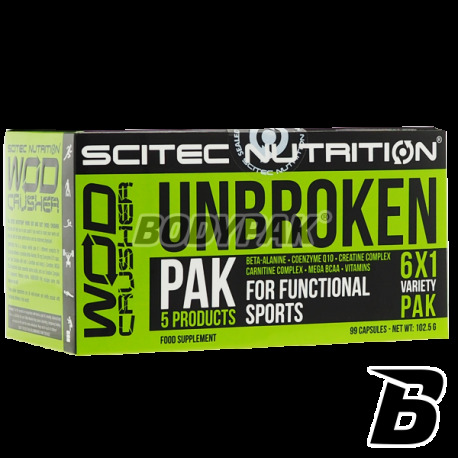 Formula WORK OUT AND DIET (WOD) CRUSHER company Scitec Nutrition® help you maintain a proper diet so that you can give it your maximum during the training, increasing the physical capacity of your body. Unbroken set PAK is a unique combination of five different products for functional athletes. Beta-Alanine contains 50 mg of coenzyme Q10, Carni Complex with L-carnitine and acetyl L-carnitine, BCAA MEGA - formula of essential amino acids and branched Crea Combat - A matrix of creatine with 11 ingredients. All of these active ingredients are well known and popular functional athletes around the world! 2 capsules Beta-Alanine and 1 capsule with any other product a day! Unbroken PAK contains 15 servings plus a few extra capsules Beta-Alanine and CO-Q10, which can take individually. The product can not be used as a substitute (replacement) of a varied diet. - mieszanka „Multi-Creatine” (1000mg): mikronizowany monohydrat kreatyny MicronTec, Cytrynian kreatyny, Fosforan kreatyny, Pirogronian kreatyny, Kre-Alkalyn® (buforowany monohydrat kreatyny). - ekstrakt z kozieradki pospolitej (standaryzowany na 4-Hydroksy Izoleucyny), Kwas Alfa Liponowy, AKG (Alfa-Ketoglutaran Wapnia), L-leucyna, Nikotynamida, Kwas Foliowy.